These photos of Pasta Jay’s are courtesy of TripAdvisor. 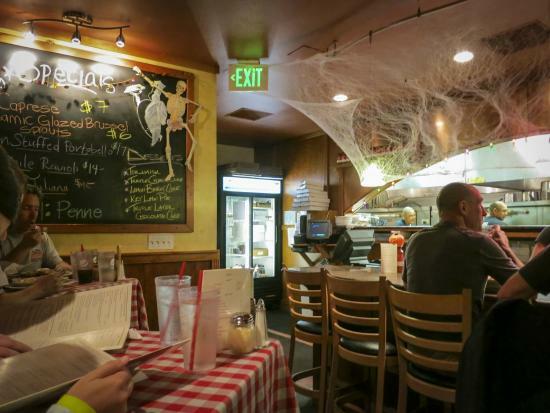 Call it ancient Italian secrets, culinary lore or a local legend in the making — Boulder’s perennially popular West Pearl Street eatery Pasta Jay’s has earned a spot in football history. Jay Elowsky, founder and owner of three metro-area Pasta Jay’s restaurants, has been feeding the Broncos lunch at Dove Valley, their Englewood headquarters, since the 2012-13 season. “When they’ve been powered by Pasta Jay’s, they’ve never lost a game,” Elowsky said. The Broncos feast on Pasta Jay’s homemade tortellini Alfredo, spaghetti and meatballs, steak bracciole, smashed sweet potatoes, salad, green beans, honey lime chicken breasts and Peyton Manning’s “taste so good” favorite: chicken parmesan. Oh, and of course, that staple of Italian cuisine, fudge brownies. Variety takes a back seat to quality, and in this case, quantity matters, too. “They always get the same thing. They’re very superstitious,” Elowsky says. The big lunch is always on a Friday, two days before the game. “The fuel that you take in is used two days later. That’s a fact,” says Elowsky, adding that this has been standard practice in athletic nutrition for at least 25 years. The Broncos take it all pretty seriously. According to Elowsky, if the team loses following a meal, the caterer is not invited back. The Broncos do like to experience different chefs, however. 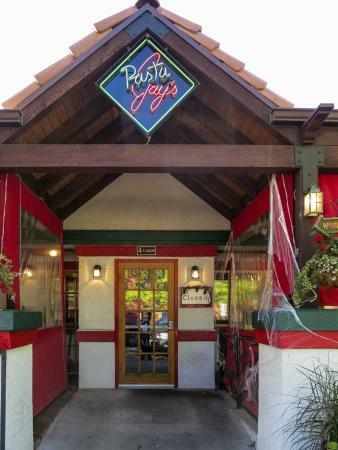 Pasta Jay’s has been invited to serve three to four meals per season and has catered some playoff games. Hard at work, Elowsky began earning his athletic-cuisine stripes long before Pasta Jay’s was serving the Broncos lunch. The restaurant cooked for the CU Buffs in various capacities since 1989, everything from daily meals to occasional fare, depending on the particular coach and policies of the day. They’ve been cooking for the hockey, soccer and basketball teams at the University of Denver for the past four years and cooked for the Colorado State University Rams in the 1990’s. Elowsky’s involvement with the Broncos goes beyond complex carbs and plum tomatoes. He doubts whether the Italian food in San Francisco will work the same magic for the Broncos when they play in the Super Bowl. “I’ll fly to San Francisco and hand off all the chicken parmesan Peyton can eat,” he volunteers. Elowsky wants the team to win, but what if they win without his food? Sounds like somebody had better get packing. The Broncos may be missing the secret ingredient to winning Super Bowl 50. That would be some Italian fare from local Colorado joint Pasta Jay’s. The restaurant often feeds the team two days before game days, with startling success. The Broncos are 16-0 when eating Pasta Jay’s two days before a game in the five years since the restaurant began feeding them, according to the restaurant’s owner, Jay Elowsky. The team confirmed the undefeated streak. Unfortunately for the Broncos, there’s no Pasta Jay’s in San Francisco. So they must deal without their good-luck charm. The Broncos don’t like to change things up when they go on a winning streak, Elowsky explained. “They’re superstitious, not sure if it’s the staff or the coaches,” he said. He added that team nutritionists like the players to indulge in complex carbohydrates two days before the game for an energy boost. The team’s favorite dish shouldn’t be much of a surprise. “Everybody loves the chicken parm,” Elowsky said, referring to the plate Peyton Manning gushes about in his Nationwide commericials. Elowsky cited the tortellini alfredo, manicotti and spaghetti and meatballs as other popular menu items for the Broncos. Pasta Jay’s brings the food from their restaurant in South Denver to the team’s facility in nearby Englewood. Two years ago, the Broncos missed their pasta when they played in Super Bowl XLVIII and were blown out by the Seahawks. That might be a bad omen but Elowsky isn’t worried. Will they be able to overcome not having Pasta Jay’s before their next Super Bowl? BOULDER – Since Pasta Jay’s, one of Boulder’s most popular Italian restaurants, has fed the Denver Broncos, the team has gone 16-0, including recent playoff wins against Pittsburgh and New England. Call it coincidence if you like, but the last time Denver went to the Super Bowl, they skipped Pasta Jay’s and lost to Seattle 43-8. The Broncos will again miss a Pasta Jay’s feed this Super Sunday. Perhaps that’s why the odds makers have picked The Carolina Panthers to win. The power of pasta has never been defeated, according to Elowsky, who has provided tortellini Alfredo, spaghetti and meatballs, steak bracciole, smashed sweet potatoes, green beans, honey lime chicken breasts and Peyton Manning’s “taste so good” favorite, chicken parmesan since the 2012. They team ate Pasta Jay’s three times in 2013-14 and came away with wins against The Redskins, The Chargers and The Chiefs. The streak lived on in 2014-15 with victories over Miami, The Chiefs, The Buffalo Bills, and The Chargers. It continued this season with wins over The Chargers, New England, and the Chicago Bears. The magic of Jay’s meatballs worked yet again in the playoffs this year as the Steelers and the Patriots wilted like overcooked linguini. Scheduling issues and the frantic confusion of preparing for a Super Bowl game in San Francisco means The Broncos will face down the NFL’s top rated Carolina Panthers without benefit of Pasta Jay’s sauce. For more information about the Power of Pasta Jay’s winning streak, call Jay Elowsky at 303 818 5827.